The glass atrium winter garden, a prominent architectural feature of the University’s new Chicago GSB Hyde Park Center, welcomes its first Graduate School of Business visitors. Faculty and staff members moved into the building in mid-September, and they welcome current and new students today, the center’s official opening day. As the beginning of the 2004 Autumn Quarter quickly approaches, faculty, staff and students in the University’s Graduate School of Business look forward to the next academic year in their new home. The new Chicago GSB Hyde Park Center, designed by architect Rafael Viñoly in response to the latest innovations in teaching methods and student collaboration, opens today. The 415,000-square-foot building at 5807 S. Woodlawn Ave. was completed at a cost of $125 million. The building includes 12 classrooms, two seminar rooms, 31 group study rooms and 42 interview rooms, where prospective students will be interviewed for admission, and where corporate recruiters will meet with M.B.A. students. 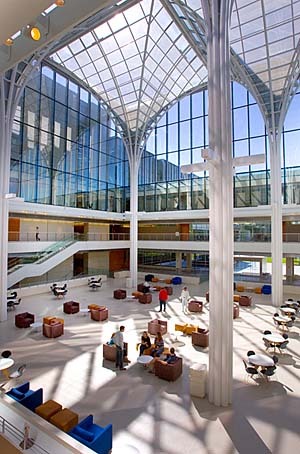 A prominent architectural feature is a six-story glass atrium winter garden, which rises through the center of the building and is topped by curved steel beams that form Gothic arches, a signature of the University’s architecture. The facility, which contains seven floors, replaces the space the business school occupied in five buildings on the University campus. Other departments will eventually move into these vacated buildings. The Chicago GSB Hyde Park Center will accommodate 1,100 full-time M.B.A. students, 110 Ph.D. students and 200 staff members, and provides 167 faculty offices. “This building reflects important changes that have taken place in business education recently, many of which were developed at Chicago GSB,” said Edward Snyder, Dean and the George Pratt Shultz Professor of Economics in the GSB. The facility also helps create a “collaborative environment among students and faculty that enhances the way business professors now teach and students now learn,” Snyder said. The new center is a cornerstone of the business school’s $250 million capital campaign, part of the University’s Chicago Initiative, its $2 billion, fund-raising campaign. Dennis Keller (M.B.A.,’68), chairman of DeVry, Inc., provided the lead gift of $25 million for the building. Other major donors include Andrew Alper (M.B.A.,’81), president of the New York City Economic Development Corporation; David Booth (M.B.A.,’71), founder, co-chairman, chief executive and chief investment officer of Dimensional Fund Advisors Inc.; and Robert Rothman (M.B.A.,’77), chairman and chief executive of Black Diamond Group, Inc. The new building is located just south of Frank Lloyd Wright’s Frederick C. Robie House and east of Rockefeller Memorial Chapel, both of which are architecturally significant buildings. The new business school center was designed to visually complement these University landmarks by including cantilevered floors and horizontal limestone on the fa�ade to reflect the Prairie-style architecture of Robie House, while the Gothic arches of the winter garden’s glass atrium reflect a key design element of Rockefeller Chapel. 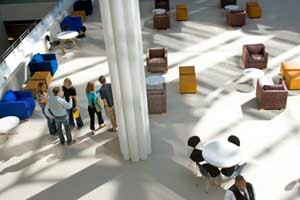 The University’s new Chicago GSB Hyde Park Center opens its doors to the campus community today. 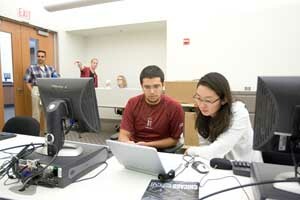 Designed to meet the needs of 21st-century teaching methods, interdisciplinary research and student collaboration, the center includes 12 classrooms, two seminar rooms, 31 group study rooms, 42 interview rooms, a dining area, a student lounge and a computer lab. Architect Rafael Viñoly designed the building to complement Frank Lloyd Wright’s Frederick C. Robie House to the north, and Rockefeller Memorial Chapel to the west. “It was clear that architectural considerations were as important as the ingenuity it would take to deal with a very difficult set of requirements,” said Viñoly, whose other recent projects include the Tokyo International Forum, Philadelphia Regional Performing Arts Center and the Boston Convention and Exhibition Center. “The Chicago GSB building has turned out better than I expected in many ways,” Viñoly said. “The University and the business school made the project a real priority that wasn’t compromised in moments of fighting over budgets or other concerns.” Other features of the building include three outdoor terraces, a 150-seat dining area and a student study area with a limestone fireplace, wood paneling and a wood ceiling. A separate student lounge contains casual seating areas and billiard tables. “The intensity of our M.B.A. program often requires students to be in the building for eight to 10 hours each day attending classes and working in study groups,” Snyder said. “A student lounge with space to relax is critical to allow students to decompress and connect informally with each other.” The design of the building also enables more informal communication between students and faculty. The way business school students and faculty interact with each other has changed since the 1980s, Snyder said, making its previous buildings not suited for today’s learning environment. Because of the school’s interdisciplinary approach to teaching, the decision was made to mix faculty offices so that a finance professor might be next to a marketing professor, who is next to an accounting professor. In addition to its main location in Hyde Park, the business school has a downtown facility, the Gleacher Center at 450 N. Cityfront Plaza Drive, and campuses in Singapore and Barcelona, Spain. “This new building when combined with our three other facilities allows us to lay claim to having the best set of dedicated campuses of any business school in the world,” said Snyder. John Huizinga, the Walter David “Bud” Fackler Professor of Economics and former Deputy Dean in the GSB, oversaw the construction of the facility, which remained on schedule and on budget since the planning began in 1999. Ground was broken in May 2002. The general contractor was Turner Construction Company.